Flame Retardant chemicals are used in commercial and consumer products (like furniture and building insulation) to meet flammability standards. 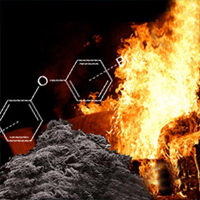 Flame Retardants inhibit or delay the spread of fire by suppressing the chemical reactions in the flame or by the formation of a protective layer on the surface of a material. They may be mixed with the base material (Additive Flame Retardants) or chemically bonded to it (Reactive Flame Retardants). Mineral Flame Retardants are typically additive while Organohalogen and Organophosphorus compounds can be either reactive or additive.